The best diplomacy fuses symbolism and substance, takes risks in order to build confidence, advances interests while listening to the other side, invites in the public but gives leaders the space needed for authentic dialogue. The recent summit held between South Korean President Moon Jae-in and North Korean Chairman Kim Jong Un appears to have done all these essential things. The resulting Panmunjom Declaration to which they affixed their signatures sets up a widely-anticipated summit between Kim and US President Donald Trump, while consolidating the foundation for building the three pillars of denuclearization, peace and inter-Korean reconciliation. The road ahead will be rocky, and nothing is assured. But the Kim-Moon summit put diplomacy on the Korean Peninsula off to a very good start. From the moment when Kim Jong Un spontaneously invited Moon Jae-in to step over the line to the North (presumably causing a momentary panic among South Korean secret service agents), the third Inter-Korean Summit took on a life of its own. Moon had asked when he would have a chance to travel to Pyongyang, so Kim impishly suggested, “Why not right now?” The two men—physical opposites, one young, short, stout; the other old, medium-height, svelte—clasped hands and crossed the line, back and forth. Harvard Negotiation Project professors Roger Fisher and Bill Ury write in Getting to Yes about the power of traveling into enemy territory on a mission of peace. By traversing the line into forbidden territory, Kim and Moon signaled to one another, and to their publics, a will to go beyond the status quo in the direction of reconciliation and peace. “Reunification” is likely to remain central to identity politics and geopolitical discourse in both the North and in the South. But the symbolism of the tree, and substance of the Declaration, embraces the paradigm of ending the war, which is not the same thing as ending the division. “Peaceful co-existence” could serve as a path to reunification, but the two are certainly not synonymous. It is hard to know the real views toward reunification among the North Korean elite or the public at large—most analysts have to infer from the testimony of defectors and read between the lines of official media. There may be significant ambivalence toward the prospect of reunification any time in the near future, given how far the North lags behind the South. South Koreans, especially the younger generation, are openly ambivalent. The vast majority of people want the artificial division ended eventually—but are in no particular rush to get there. An extended period of learning to get along and get reacquainted, “peaceful co-existence” in other words, would be perfectly acceptable to most South Koreans. After the tree planting ceremony, Moon and Kim ambled off for the proverbial “walk in the woods.” They crossed a footbridge and sat at a wooden bench, talking over two cups of tea. At first it looked like more theater, and a live video feed continued to roll, albeit filmed at a distance and without audio. But then Moon and Kim shooed away the gaggle of close-up photographers, one of whom, from the North Korean pool, looked like he really did not want to leave them alone. They created a moment of direct dialogue, in view of the world yet out of earshot. Just the two Korean leaders, speaking their shared native language, nothing lost in translation. They sat there for half an hour, talking, listening. Their body language was serious, animated, spontaneous, intense. What did they discuss? Whatever it was probably can’t be found in the joint declaration, which was released to reporters too soon after they finished their chat. One can surmise that Moon conveyed the gist of what he learned from the tête-à-tête to President Trump during their 75 minute phone call after the summit. Perhaps this is also when Moon brought up Japan and received a message to pass on to Prime Minister Shinzo Abe. At this opening stage, the authenticity of the dialogue may be as important as any specific position relayed or message passed. Given the risks involved in making peace on the Korean Peninsula, Kim and Moon—and next, Trump—will need to have the confidence they can work with one another. The official business of the day concluded with another unconventional move by North Korean standards, when Kim and Moon strode out to podiums set up on the steps of the Peace House and delivered prepared remarks to a live press conference. Although they did not take questions, it was an extraordinary moment that showcased Kim acting in conformity with standard protocols of international diplomacy (who knows, maybe he would take a question or two in a joint presser with POTUS). Kim’s remarks were general, stressing the theme of Korean brotherhood, while Moon stayed closer to the text of the joint statement. How to read the Panmunjom Declaration? First of all, as a text it cannot be read in isolation from the previous inter-Korean accords. Indeed, the Panmunjom Declaration is self-conscious of the agreements already reached in 1972, 1992, 2000 and 2007. 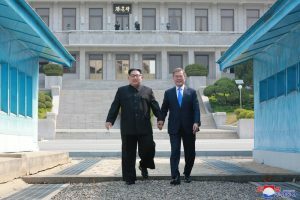 Cynics might dismiss the Declaration, and the summit as a whole, on these grounds—“We’ve seen this movie before.” “Happy Groundhog Day!” But for the Moon government, which inherits the spirit of the liberal administrations of Kim Dae-jung and Roh Moo-hyun, the earlier agreements allow them to quicken the pace of inter-Korean progress. The basic principles and grand vision have already been established, freeing them to focus on forward action. The Declaration tells us that Kim Jong Un and his team agreed. And so there is a practical and action-oriented tone to the document, especially in the first section on inter-Korean relations. The Panmunjom Declaration calls for “taking active measures” and “fully implementing all existing agreements and declarations.” This includes opening a joint liaison office in Kaesong, reviving civic exchanges (targeting the June 15 anniversary of the first inter-Korean summit), “swiftly resolving the humanitarian issues” (with reunion of separated families recommencing on August 15), and “adopting practical steps” on railway and road connections across the DMZ. In a second section of the Declaration dedicated to lowering risks, easing tensions and building confidence between forces on the Peninsula, Kim and Moon ordered their militaries to resume high-level military talks (generals are to meet in May) and organize “frequent meetings” as well as “active mutual cooperation, exchanges, visits and contacts.” The language leaves room for proactive efforts at peacebuilding such as joint observations of military exercises. Notably, no mention is made of the South’s joint military exercises with US forces. The document calls for ceasing hostile acts along the land border and “devising a practical scheme” to deconflict the contentious maritime border in the West Sea, turning it into a “maritime peace zone.” Here is another topic where the Kim and Moon teams can move quickly to an implementation stage based on agreements reached at the last summit in 2007. In the third and final section, the Declaration widens out to the larger project of building a “permanent peace regime” in place of the “current unnatural state of armistice.” On the basis of their 1992 Non-Aggression Agreement, North and South agree to phased disarmament—here the language sounds tentative. But specificity returns in announcing a new initiative: Kim and Moon agreed to establish peace talks including the United States—and perhaps China as well. Trilateral talks at the official level to “declare an end to the War” would be unprecedented. Saving the most anticipated for last, the third section concludes with point four: “South and North Korea confirmed the common goal of realizing, through complete denuclearization, a nuclear-free Korean Peninsula.” Interestingly, no explicit mention of the United States appears, except as a member of “the international community” whose support and cooperation is sought. But the unspoken subtext of point four is the fact that Trump and Kim are finalizing plans to hold a summit of their own, and that Trump is on record as wanting to resolve the long-running nuclear dilemma in a way that is good not only for the United States, but also for North Korea. Kim Jong Un signed his name to a document committing him to the goal of complete denuclearization of the Korean Peninsula—a document that was reprinted the next day in the Korean Workers’ Party newspaper and read aloud on North Korean television news. The Blue House later quoted Kim as saying, “If we maintain frequent meetings and build trust with the United States and receive promises for an end to the war and a non-aggression treaty, then why would we need to live in difficulty by keeping our nuclear weapons?” On the one hand, Kim is repackaging the standard North Korean position that their nukes are simply a deterrent against the “hostile policy and nuclear threat” posed by the United States. But Kim also hints at what he wants—a normalization process (frequent meetings and building trust) and security guarantees (ending the war and a non-aggression treaty) that allow him to pursue his ultimate goal of economic development (no longer living in difficulty). Next comes Trump and Kim’s moment to move this diplomacy forward, starting with the bold and risky move of a summit. Each leader will decide if he can have confidence in moving forward with the other. If the answer is yes, then they—and their negotiating teams—will have to hammer out the plan for the right pacing, verification and settlement that can achieve durable peace and complete denuclearization. For a variety of political and technical reasons, the negotiation and implementation will be incredibly difficult. It is, however, the right way forward. And the Moon-Kim summit helped it along to the next step.